Having a family of four children means that our task, when picking holidays, is always to find something that will entertain and – hopefully – educate our three energetic boys and our fun-loving two-year-old girl. No less important is some well-earned downtime for us, as well as activities to excite our interest. A trip to the picturesque Menorcan village of Ses Salines, with Minorca Sailing Holidays, did not disappoint. Their focus on families is truly a breath of fresh air in an age where the individual often takes precedence; here you can do as much or as little as you like, with the family or solo, so an ideal combination. 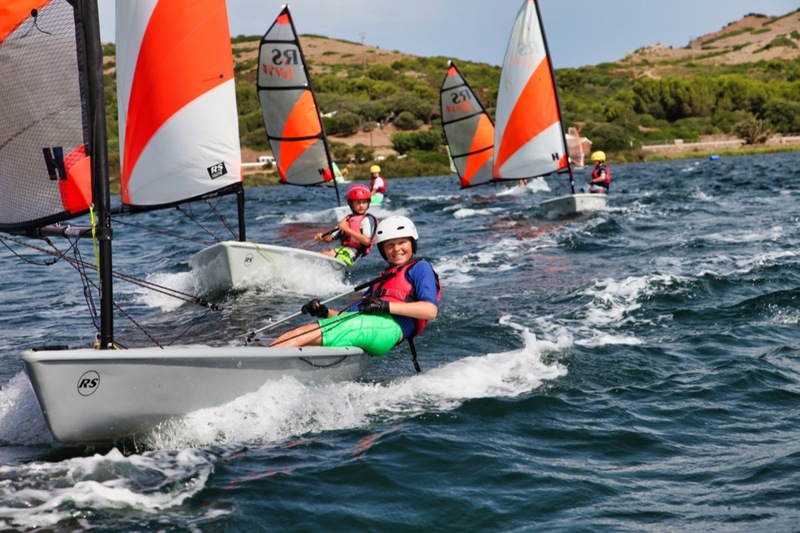 With a top-of-the-range, modern sailing and windsurfing fleet set in the idyllic and safe bay of Fornells in the north of this stunning island, Minorca Sailing offers active families a fantastic escape from normality. From the moment we arrived, we felt fully ‘on holiday’. The nature of the setup – bringing together excellent organisation and the naturally relaxed atmosphere of Menorcan village life – meant that we were able to unwind instantly. Minorca Sailing Holidays offers a broad array of accommodation opportunities, from local hotel and apartments to spacious villas with private swimming pools. All their accommodation is within a five-minute walk of the beach front – the epicentre of your stay; the village’s limited traffic means you can feel confident that youngsters can navigate the local streets on their own after a day or two of familiarisation. The fact that we were able to feel so relaxed is testament to the safe and welcoming environment that is fostered in Ses Salines. A typical day for us began with drop-off at the very popular children’s club, giving the adults a good couple of hours on the water or sun lounger, depending on our mood. Opportunities included RYA (Royal Yachting Association) lessons; one-to-one instruction; and free-sailing or windsurfing, where your kit was all rigged up and ready for you (we called it 'valet sailing'), making for relaxing sessions out on the water, knowing that you could simply hand your boat back to a smiling staff member when you had had enough. The equipment itself is some of the most extensive to be found in the Mediterranean, with a vast array of modern dinghies, all of which are fastidiously maintained. The same goes for the windsurfing kit, which provides guests with the chance to get on the water, whatever the wind conditions. Minorca Sailing Holidays tries to ensure they keep fully abreast of any technological changes available to the water sports community; this is reflected in the fact that the centre has a couple of foiling Waszp dinghies and a number of foiling windsurf boards, to give people the opportunity to sail like an Americas-Cup legend. The sheer volume of equipment available means that you will never go wanting when it comes to spending time out in the bay of Fornells. The waterfront team is calmly professional, but also makes sessions entertaining and engaging, and will tailor their approach, whether you are novice or hardened, dinghy racer or windsurfer. Whether you prefer to race with others or go solo, Minorca Sailing Holidays will cater for you. For those less interested in items with a sail, there is a great morning yoga class, beauty treatments available at your villa and paddleboards to be used on the waterfront, if you feel that way inclined. Life away from the water revolves around a couple of focal points in Ses Salines, including local barbeque restaurant, Ca Na Marga. We enjoyed lunch by our pool each day, but could easily shop at the local 'supermardo', owned by the lovely Ellie, who came to Menorca as an instructor a number of years ago and never left. In fact, it is testament to the standards of this company that staff tend to stay for a long time – and that goes some way to explaining the fantastic allure for families who enjoy the consistency that Minorca Sailing offers. Located a 15-minute walk away is the pretty village of Fornells, which offers guests a number of alternatives when it comes to eating out, with local fish clearly being the major draw of this charming village. We were fortunate enough to be there during local fiesta week (a highlight of the calendar), with parading horses and an amazing underwater firework display. A week’s stay culminates in a regatta day, and the prize-giving that follows in the aforementioned Ca Na Marga. For anybody who is looking for a water-sports-based holiday, we believe it is hard to beat Minorca Sailing Holidays. A trip to Club Isabella – a 15 minute walk away, up to the headland – to see the sunset with a sundowner and sushi, is definitely to be recommended. For those who enjoy running, there are some great runs locally, including to the pretty beach at Cala Tirant. We loved Restaurante Sa Nansa, in Fornells where the children snorkelled till 8pm each evening, then we enjoyed great pizza, delicious seafood and a good selection of wines.